* Very Fine and Sophisticated Craftsmanship on High Purifying Fine Jewelry ~ truly Stunning, Exquisite and Remarkable ! * Handmade Tribal Handbags, Backpack Bags, Waist Bags, Embroidered Skirts and Embroidered Shoes available@ Interact China too! 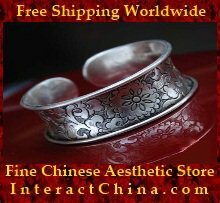 This fabulous and alluring silver bracelet is truly a unique piece – 100% hand carved and designed by ethnic Miao jewelry designer, using 99.9% pure silver as main material. Miao (or called Hmong, same rooted) enjoys good fame for its aboriginal design in silver jewelry. You will love the fact that it contains many aboriginal geometric / motif designs, yet match surprisingly well with modern aesthetic taste! You will also be amazed for its very fine and sophisticated craft work, whereas a precious craftsmanship is required for carving high purifying fine jewelry, like this particular piece. 7'" STAR of DAVID Bracelet in 925 Sterling Silver. Bracelet My heart. Sterling Silver.